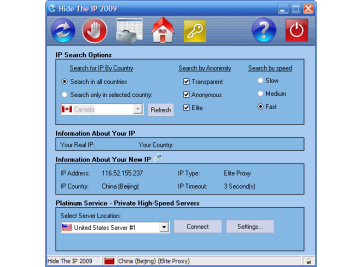 This is a Hide IP software which will change your real Internet address while browsing the World Wide Web. The software will deliver you fresh anonymous proxy servers every time you activate the program. The main benefit of this software is that you can't be traced while browsing Web sites. If a Web site is restricted for users from specified country the program can bypass that protection. By hiding your IP, you will be invisible for marketers, thus, you will prevent any spam mails. You can use web based e-mail to send anonymous e-mail. Post on bulletin boards without displaying your real IP address. Version 2.2.1.1 may include unspecified updates, enhancements, or bug fixes. This is a Hide IP software which will change your real Internet address while browsing the World Wide Web. The main benefit of this software is that you can't be traced while browsing Web sites. You can use web based e-mail to send anonymous e-mail.